PHOTOS: Wild Weather In Chile Leaves Millions Without Access To Running Water : The Two-Way Authorities cut off service to the capital, Santiago, following torrential rains that contaminated the water supply. People are now scrambling to find alternative sources of drinking water. A woman draws water from a pool on Sunday after officials in Chile's capital city, Santiago, cut off the water supply. Millions of people in Chile are scrambling to find alternative sources of drinking water after authorities cut off service to the capital, Santiago, following torrential rains that contaminated the water supply. At least three people are dead and 19 others missing after the heavy storms. The waters have isolated another 830 people in mountainous surrounding areas, according to the country's national emergency office, Onemi. The majority of those stranded are in the O'Higgins region, south of Santiago. "Emergency teams are working on the ground to connect the isolated people and restore the water supply wherever possible," Chilean President Michelle Bachelet wrote on Twitter. 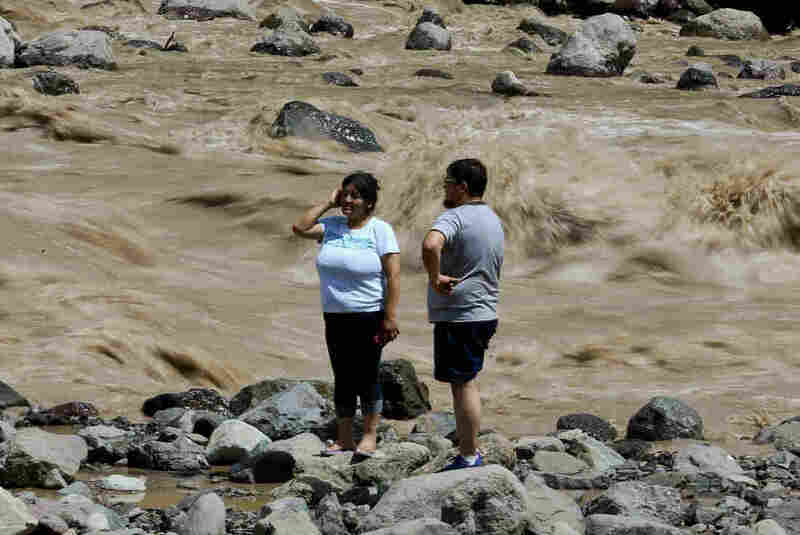 The supply was compromised because heavy rains "triggered mud and landslides that sent debris flowing into parts of the river system, including the main waterway that supplies most of the homes in Santiago," as NPR's Philip Reeves reports. The governor says some 4 million people have been impacted, according to Philip. "Reports say many people armed with buckets and pans are collecting water from emergency taps on the streets," he says. "Bottles of water are selling fast in shops and supermarkets, and some businesses and restaurants have had to close until the drinking water supply's switched back on." Scuffles were reported at some supermarkets between people trying to buy bottled water, the BBC reports. It's not clear how long the water supply will be off — the capital's water provider, Aguas Andinas, says the continuing rain was hampering repair efforts, according to Reuters. 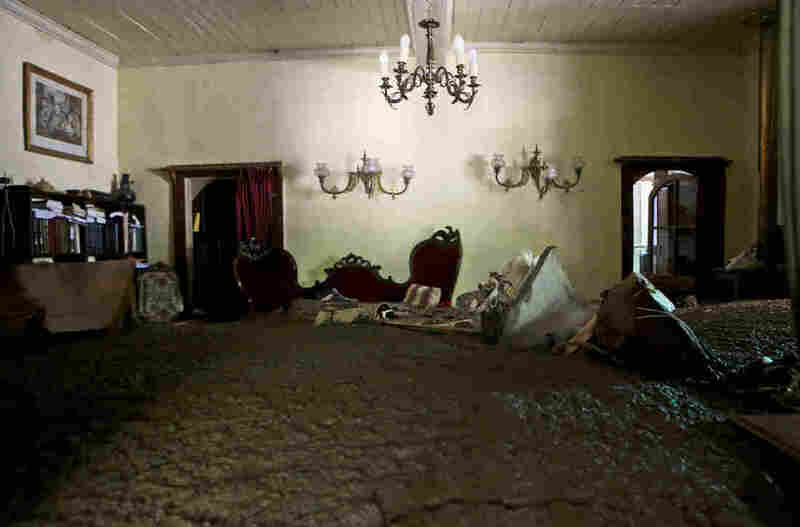 Meanwhile, photos from Santiago and surrounding areas show swollen rivers and sludge flooding into people's homes. This is happening during the summer months in Chile. Regional Gov. Claudio Orrego told the BBC that the heavy rains are "absolutely anomalous" for this time of year. The broadcaster adds that the flooding follows "months of drought and a series of deadly wildfires which burned for weeks."